Kevin Christiana is hard at work at his Spring collection for Mynt 1792 so I stopped by to see how the process was going and to have Office Fun Day where nothing really ever gets done. 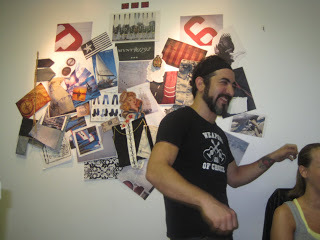 Check out his inspiration board for his "Naughty Nautical" Spring collection. I'm still researching what my contribution will be to the board! Below is my outfit of choice for the day pre-rain storm and post-big-night-out. I threw the studded vest on to toughen up the pretty florals and pale color palette.